A team of researchers from Greece and Spain have managed to synthesize silver nanoparticles, which are of great interest thanks to their application in biotechnology, by using strawberry tree leaf extract. The new technology is ecological, simple, cheap and very fast. Strawberry tree leaf (Arbutus unedo) and silver nitrate (AgNO3). With just these two ingredients scientists can now produce silver nanoparticles, a material that is used in advanced technologies from compounds for distributing medicines through to electronic devices, catalysts, contaminant solvents. 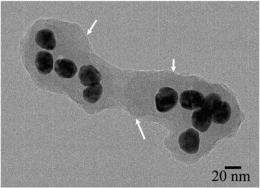 This shows silver nanoparticles surrounded by the organic layer. Credit: Image courtesy of N. Michailidis et al. The technique has been developed by scientists at the Aristotle University of Thessaloniki (Greece) and Madrid's Carlos III University (UC3M) and consists of adding an extract of the leaf to a silver nitrate aqueous solution. Silver nanoparticles form immediately after stirring the mixture for some minutes. "There are other methods for producing them but this process is the most simple, low cost and easy to implement given that a non-toxic plant is used at a temperature of between 25ºC and 80ºC", outlines Sophia Tsipas, UC3M researcher and coauthor of the study, which is published on the Materials Letters journal. Tsipas adds that "the innovation of this method lies in the fact that it allows us to control the parameters for obtaining nanoparticles of a known size (from 5 to 40 nm) and geometry (spheres, pyramids, cubes). The nanoparticles produced remained stable over long periods of time of up to 6 months." 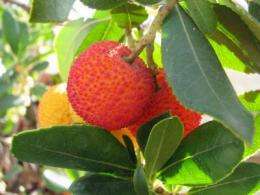 Strawberry tree leaves facilitate such stability as they form an organic layer of various nanometres around the silver particles. What is more, the extract acts as a reducing agent and stabilizer for the entire product. The nanoparticles obtained have been characterised and verified with various techniques (transmission electron microscopy, ultraviolet spectroscopy and FTIR). As well as optimising the process, the team is currently studying how to produce similar nanometric sized particles with other metals like gold and copper.